IRS Form W-4 is a U.S. Department of the Treasury - Internal Revenue Service - issued form also known as the "Employee's Withholding Allowance Certificate". A PDF of the latest IRS Form W-4 can be downloaded below or found on the U.S. Department of the Treasury - Internal Revenue Service Forms and Publications website. of the worksheets for Form W-4. tax return, and you might owe a penalty. if both of the following apply. expect to have no tax liability. 3, 4, and 7 and sign the form to validate it. ES, Estimated Tax for Individuals. Otherwise, you might owe additional tax. earned by a spouse, during the year. Line F. Credit for other dependents. 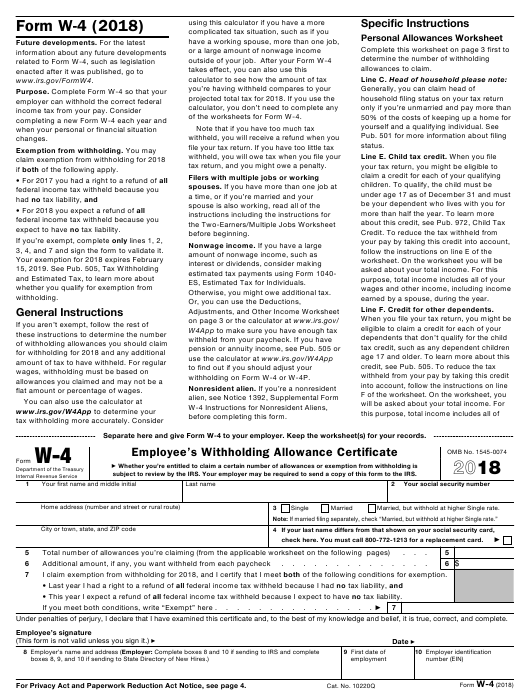 withholding on Form W-4 or W-4P. flat amount or percentage of wages. Separate here and give Form W-4 to your employer. Keep the worksheet(s) for your records. check here. You must call 800-772-1213 for a replacement card. If you meet both conditions, write “Exempt” here . For Privacy Act and Paperwork Reduction Act Notice, see page 4.
income earned by a spouse, during the year. a designated State Directory of New Hires. might be subject to a penalty. take these credits into account. W-4. See Pub. 505 for details. you don’t wish to do so. at least 60 days, enter the rehire date. Enter “1” if you will file as married filing jointly . Enter “1” if you will file as head of household . • If your total income will be less than $69,801 ($101,401 if married filing jointly), enter “1” for each eligible dependent. Adjustments, and Additional Income Worksheet below. Two-Earners/Multiple Jobs Worksheet on page 4 to avoid having too little tax withheld. your income. See Pub. 505 for details . Enter an estimate of your 2018 nonwage income (such as dividends or interest) . Divide the amount on line 7 by $4,150 and enter the result here. If a negative amount, enter in parentheses. Note: Use this worksheet only if the instructions under line H from the Personal Allowances Worksheet direct you here. you and your spouse are $107,000 or less, don’t enter more than “3” . and on Form W-4, line 5, page 1. Do not use the rest of this worksheet . figure the additional withholding amount necessary to avoid a year-end tax bill. Subtract line 5 from line 4 . Multiply line 7 by line 6 and enter the result here. This is the additional annual withholding needed . instructions for your income tax return.